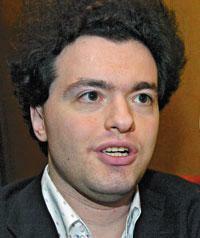 The JC yesterday broke the news that Russian pianist Evgeny Kissin has spoken out against what he perceives as an anti-Israel bias in the BBC, accusing the organisation, in a letter to its director general Mark Thompson, of broadcasting material “painfully reminiscent of the old Soviet anti-Zionist propaganda”. "At the end of March 1984 I made my big debut playing both Chopin concerti in the great hall of the Moscow Conservatoire. That concert was recorded live, that was my first recording and it was a big event. The following day a representative of the Kremlin phoned my teacher and invited - so to speak - me to play on Lenin's birthday, which was due 3 weeks later, the 2nd and 3rd movements of Dimitri Kabalevsky's third concerto. I didn't want to do that, I didn't want to learn that music. And then I was explained about the official anti-Semitism in the Soviet Union, of which I had not been aware before. I had experienced a daily life kind of anti-Semitism on numerous occasions but I wasn't yet aware of the fact that it was also an unofficial government policy. So I was explained that I couldn't possibly do everything I wanted to do and not do everything I didn't want to do..."
No doubt there will be people who say Kissin should "shut up and play the piano", as they said to Krystian Zimerman when he spoke out against America's missile shield that was to be stationed in Poland, and to Daniel Barenboim when he speaks up in favour of more peaceful practices in the Middle East, building the necessary bridges through music. A few points. First, artists have the right to speak out, same as the rest of us. Secondly, you can see where Kissin's coming from, in terms of his own background (in case you didn't know, in Russia being Jewish is regarded as a nationality, not a race or religion, let alone a personal choice). But thirdly, everyone wants the BBC to say only what they think themselves: there are plenty of people who would (and do) accuse it of bias in completely the opposite direction. The Beeb, however, appears to be running so scared and is so busy complying with compliance that it hesitates to stick its neck out at all, in any direction, ever, even at times when it should have a responsibility to do so: its failure to broadcast the charity appeal for the victims of a tragic war last winter was reprehensible. But because the war happened to be in Gaza...well, you know the rest. So the JC knows what's in EK's letter to the BBC before the BBC does? As they say on Facebook: woot? I've watched Kissen for years and enjoyed hearing his great musical gifts, but am saddened to hear what he and others, Jew or Arab, for that matter, still endure from ignorance and ignorance proudly compounded. How can we be so lame and so proud of such cluelessness in thought and behavior and not see our common humanity--and genius? Either there is bias in the BBC's reporting or there is not. One would have to look at the particular report that Kissin was criticizing, or the series of reports, editorials, etc., as the case may be. To find bias one must first know the truth and the facts; second, one must know that the BBC knows them or could easily find them out; third, one must then be able to demonstrate that those facts and that truth have been disregarded. Not knowing these things off hand, but having a sense of Kissin's talent, personality and character, I am inclined to believe Kissin -- especially in view of the anti-Israeli rhetoric I hear from the political left in the United States, which amounts to barely concealed Jew-bashing. Israel is not pefect by any means, but it was created by the UN after Jews were murdered in Europe. The Islamists who hate Israel also hate the West in general and all whom they consider to be "infidels." They have attacked innocent and uninvolved U.S. civilians, British subjects and citizens of countries on the European continent. When you consider the fact that the Nobel Peace Prize was given to a man -- Arafat -- who approved of (if he did not himself engineer)the callous murder of Israel athletes at the Munich Olympics, you have to wonder what some people in the West are thinking. The war in Gaza took place because the rulers of Gaza were openly determined to destroy Israel and all of its Jewish inhabitants, and because they had kidnapped an Israeli soldier and launched rocket attacks on Israel. They did this in response to being given Gaza by Israel -- a gift that Israel did not have to make. What other country in the world has conquered territory and then given it back to the enemy? I can't think of one. But Israel is expected to follow a standard that no one else follows. All of which leads me to deplore those in the West whose attitude towards Israel is well summed up by the saying "This dog is vicious. It bites when you kick it." Have you been to Gaza yourself recently, szeni? If so, please tell us more about what it is really like there? If the BBC is 'running scared', it's from broadcasting anything positive about Israel. I worked for the Beeb two decades ago and know half a dozen people who are big cheeses in the Bush House. One or two with a kind word for Israel keep it to themselves; they know it won't be good for their career. As for 'Anonymous' weeping 'for entire people', Israel has been a blessing for the Arabs. Until Arafat and his gang arrived from Tunis, Palestinians had some of the highest living standards, health and education indicators etc in the Arab Middle East. Fast forward and welcome to a Jew-free Gaza, where Arabs throw their 'brothers' from roof-tops and burn down Christian book shops. Is 'wonderful pianist' Barenboim too busy slugging off Israel to supply Hamas with a soundtrack? An update: was interested to see in this week's JC a letter from Lilian Hochhauser, who had previously voiced her support for Kissin's campaign. The JC doesn't put its letters online, so here's part of what she says: "...Whilst the BBC must be urged to change its anti-Israel bias, [Kissin's] letter contained intemperate and highly inappropriate comments and I wish categorically to dissociate myself from it." I get the impression that like many other musicians Mr. Kissin spends and has spent too much time at the ivories. Maybe like the other wonderful pianist Daniel Barenboim he should actually take some time to visit Palestine and see the reality of what his beloved Israel has done to an entire people. This I think would change his views. Actually, "Woot" means more or less "Hooray!" The expression you're looking for is "WTF?" As for the remark from the "BBC spokesman," the translation is, "Er, we need time to think about this and get the answer exactly right. We'll get back to you on that."